Larry Summers is not keeping his feelings about the Republican tax plan a secret. "I think it's a serious policy error that will make middle class Americans poorer," the former Treasury Secretary told CNN's Jamie Gangel on Thursday. Summers has been a vocal critic of both President Trump and the GOP's framework for tax reform. He has reiterated his criticism of current Treasury Secretary Steven Mnuchin, who claims tax reform will pay for itself, and expressed concerns about how the proposal will add to the national debt. "There's little reason to think this is going to spur much investment or growth. Look how low interest rates already are. Look how high the stock market is," he said. Summers, a Democrat who led the Treasury Department under President Clinton and served as one of President Obama's top economic advisers, called the Trump administration's claim that middle class American families will receive a pay raise of $4,000 to $9,000 "ludicrous" and "absurd." While Summers agrees that the corporate tax rate should be cut, he said he's worried that the House and Senate bills favor businesses over individuals. "I cannot understand what possible values would lead you to set up a tax plan where the benefits to people go steadily down over time and the benefits to corporations go steadily up, up over time," he said. And he called it "madness" that Senate Republicans wanted to wrap in a repeal of the Obamacare individual mandate, which requires people to have health insurance. Summers has been particularly critical of Mnuchin's claims as to how much the GOP tax plan will cost. 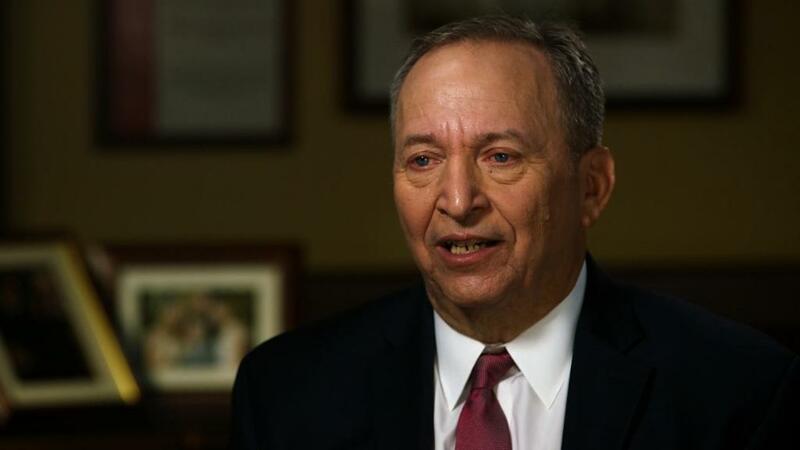 In an interview with Politico, Summers said he was "not aware of so irresponsible an estimate coming from a Treasury secretary in the last 50 years." He told Gangel that he doesn't think he's made it too personal. "I've been doing this for a lot of years and I've never said anything like that about any public official before. But when claims become unmoored from any possible reality, I think it's important to call that out," Summers said. Mnuchin, for his part, said Sunday that "lots and lots of economists" have come out in support of the administration's claims. "We've been completely transparent. Different models will show different things," Mnuchin said. Mnuchin seems to be under a lot of pressure from Trump, Summers said. "There's enormous pressure within that administration for loyalty and fealty," he said. Still, Summers said that he would have resigned by now. "I would have resigned to any administration of which I was a part that had gone anything like this far, in terms of fake facts on the economic side, or in terms of embracing racists in its political rhetoric," he said. " ... I don't know how some of these people face their children." He said he's "surprised and disturbed" that there haven't been more resignations, especially considering President Trump's response to a rally of white supremacists in Charlottesville. The president blamed the conflict that left one counter-protester dead on "many sides." "The idea that there would be an expectation that cabinet officials would be defending comments at press conferences that others saw as racist, that doesn't seem to me to be a healthy way to run a government," Summers said.